Coffee House Outdoor Restaurant Dining Chair with Stackable Aluminum Frame - 8 lbs. Our Coffee House restaurant chair features slated faux teak wood that makes up the back and seats. 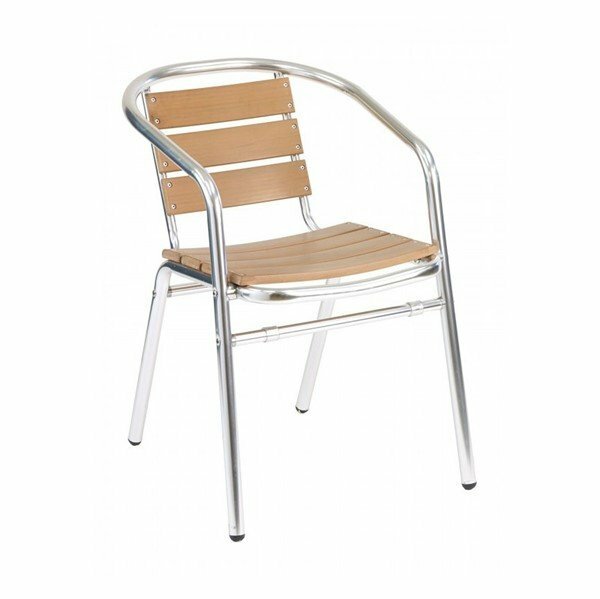 Combined with an anodized aluminum frame and you have a modern styled dining chair that gives a natural look to any location. This chair has a stackable design for easy storage and movement. Perfect for outdoor patios at cafes, bistros, and coffee bars. Our restaurant dining chairs are built to last and come with a 2-year commercial warranty. • Dimension: W 16.5" x D 16.5" x H 28"